What is Famille Verte and Famille Rose? Chinese porcelains are initimidating to the novice of which I am one. I have a question about a baluster jar with lid which I own. It was described as famille-verte. Could you please comment on that ascription and give an approximate dating of my jar? Was famille-verte made much after the Kangxi period? In other words, just because it was introduced during this period does not mean that it was not abundantly produced after this period, does it? Every time I see something that I think is famille-verte or famille-rose I find that it is described differently. Do you have a good definition for determining whether something is famille-verte/rose or not? The point is that just because there is green paint on or under the glaze does not mean it is famille-verte - so what is the criteria? To my mind your baluster vase is made early in the 20th century. I believe so because the shape is slightly different from the typical early 18th century ones I have seen. The rim of the lid is a little too wide and the neck of the vase is a little too high. 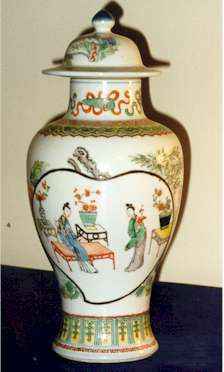 The decoration is nice, but is not combined and held together the way 18th century vases usually are. There is a slight chance that it could be a mid 18th century copy of an early 18th century vase but I would seriously doubt that. I mention this only to let you know there is a limit to what I can do at a distance without handling the piece. Regarding "Famille Rose" and "Famille Verte" I will give a brief explanation below. This is also explained - with pictures - on a special page on export porcelain patterns on this site. Kindly just look for this page or use the search engine to locate it. Regarding your vase, it is painted in a generally ok "Famille Verte " style. 1. Date of production. Famille Verte should be Kangxi, Famille Rose should be Yongzheng or Qianlong. 2. Style - Famille Verte should be Chinese in style and refer back to Chinese prints and paintings of the Kangxi era. Famille Rose should be a flowery export style based on the emerging Rococo style in Europe. 3. Enamels. The enamels used in these families are different both in their number and technically, so as the Famille Verte is clear (translucent) and Famille Rose is mixed with white (opaque). There is nothing to stop a dealer to call a 20th century piece painted in the right style and with basically the right enamels Famille Verte if he wants to. But, he should add the date of production.